Completing an event is ultimately a race against yourself. Seeing if you can go a little bit faster, a little bit longer or a little harder each time. Training for an event is about incremental improvements—numerous small and consistent changes that yield positive results over time. 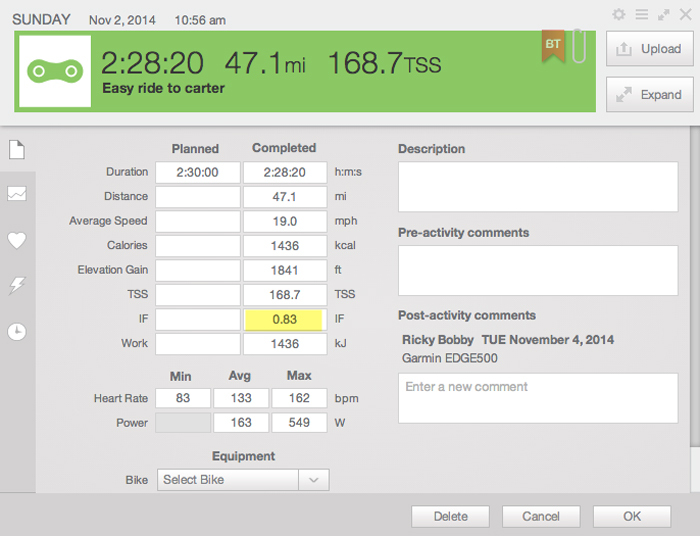 At TrainingPeaks we have found that the best way to train is to choose a specific goal (i.e. a race), then get expert instruction and focused training (i.e. through a coach, a training plan or a personalized Annual Training Plan) with regular feedback in order to reach your goal. This type of deliberate practice has worked for world champions and committed endurance athletes of all levels. A key component of this methodology is the feedback you receive. Whether it involves a coach analyzing your workout files, or you managing your own TrainingPeaks dashboard and fitness metrics, getting immediate feedback allows you to plan and track your training in the most optimal way. But knowing exactly what to measure and how to do it most efficiently can be overwhelming—but only at first. There are a wide range of available devices in which to record everything from distance and duration to heart rate, power, cadence and more. If you are an athlete just starting out and not quite ready to make the investment in a GPS device, then there are several smartphone apps that can record your workouts. Once you have decided on how you are going to record your workouts, the next step is uploading them to your TrainingPeaks account. Once your workout is in your account you can click on the completed workout, which will open a quick view summary of information such as how long the workout was and how far you ran or rode. But you may also notice some three letter acronyms listed as well such as TSS and IF—but what the heck do they mean and how can you use them? These abbreviations represent some of the metrics that you will find in TrainingPeaks and they are the key to measuring improvement and reaching your potential! Most of the metrics in TrainingPeaks are based on a Functional Threshold (Power, Pace, or Heart Rate) so it is important that you have this right before jumping ahead to some of the other metrics. Functional Threshold represents the maximal effort you can maintain for around an hour without fatiguing. For some athletes this will be less than an hour and for others it might be slightly longer, but the important thing is that it provides a useful benchmark by which to measure your training. To get the most accurate number you will need to perform an hour long test and then use the average power, pace or heart rate from that test as your threshold. However, going all out for an hour is HARD and requires a lot of focus and motivation, not to mention that it could be very disruptive to your other training. So instead of performing an hour long test, consider using one of these other methods which are shorter but will still provide a good estimate of your functional threshold. You can learn more about getting started training with power here. Once you have determined your functional threshold you will want to use that number to establish your training zones under your account settings. Click your name in the upper right and then select “settings.” Next click “Zones” on the left hand side. Here you can choose from Heart Rate, Power, or Speed/Pace. The zones you choose will depend on what sport you are setting the threshold for (i.e. cycling, running and swimming) and it should be noted that you can have multiple types of zones for a single sport. For example, if you are a runner and have a GPS device and a heart rate monitor, you would want to set both a pace threshold and a heart rate threshold. Select the type of threshold you want to set from the left and then scroll down past “Default” and select “Add Activity.” You can then select the sport type from the drop down menu. Next enter your threshold in the box then under “Auto Calculation” choose “Threshold” and under “Method” select which methodology you want to use such as Joe Friel or Andy Coggan. Finally select “Calculate” and you will be provided with zones which represent the paces, heart rate or power you would want to target for different workouts based on what you are working on that day. For instance, if you are out for a general endurance run you would probably want to spend most of your time in Zone 2. 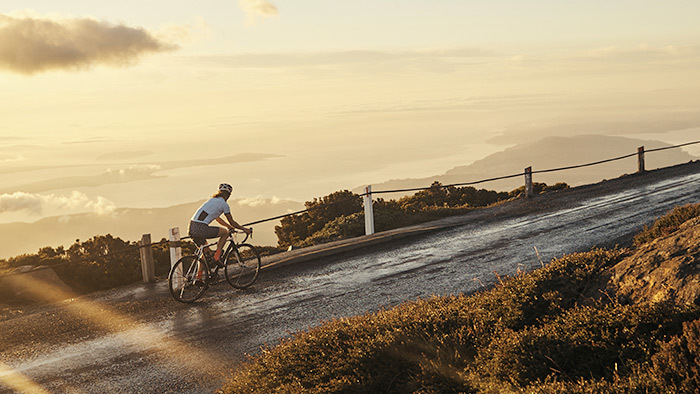 In cycling, Normalized Power provides an estimate of the metabolic cost if the ride would have been paced steadily and places an emphasis on the surges during the ride. Think of riding your bike like driving a car. You are going to use less gas while driving on the highway at a steady speed than you would driving in the city and constantly having to come to a stop and then hit the gas again to get back up to speed. Normalized Power provides a picture of how hard a ride felt and while the Average Power may be relatively low, the Normalized Power could be high due to surges in speed throughout the ride duration. In running, Normalized Graded Pace takes the hills into account, and estimates what your pace would have been if you were running on a flat course. Now that we know how hard we can go for around an hour (FTP) and we have a way to estimate how metabolically taxing a workout was (NP/NGP) we can now measure how intense that workout was relative to our threshold through the Intensity Factor (IF). 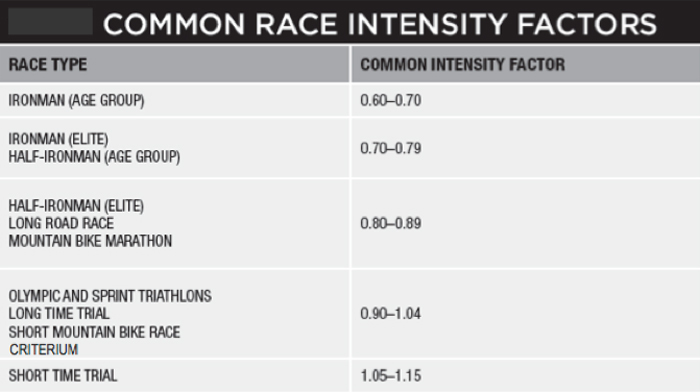 Intensity Factor is simply how intense a workout was relative to our threshold and can be read as sort of a percentage of 1 with 1.0 being your threshold. If the Intensity Factor for your workout was .80 then we could say that you performed that workout at 80 percent of your threshold. General endurance work falls in the 60 to 70 percent range, while a harder tempo workout would be closer to 80 to 90 percent. Additionally, depending on the duration of your race you may see an IF of up to 105 percent or 1.05. Intensity Factor is calculated by dividing your NP or NGP by your functional threshold. So if your FTP is 250 watts and you did a workout with a Normalized Power of 200 watts then you would end up with an intensity factor of .8 or 80 percent of your threshold. In addition to providing information on the relative intensity of your workout you can also use this number to get an idea of the relative intensity of different race durations. Republished with permission of VeloPress from The Power Meter Handbook by Joe Friel. Learn more at velopress.com/power. Finally we have Training Stress Score, which is a score given to a workout to tell you how hard it was. Whereas IF told you the relative intensity of a workout relative to your threshold, it is only one side of the equation. If you did a workout at 90 percent of your threshold for two hours it would surely be much more stressful than doing 90 percent of your threshold for 45 minutes. Training Stress Score takes both intensity and duration into account and provides you with a more complete view of how stressful that workout was in the overall picture of your training. 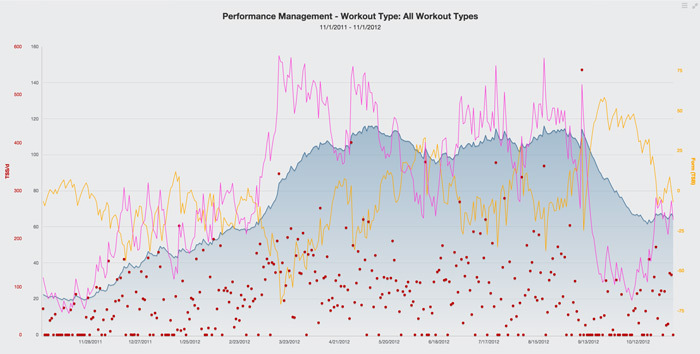 To take this idea a step further, TrainingPeaks uses this daily Training Stress Score to model your Fitness, Form and Fatigue by using a weighted average of a set number of days and modeling them in the Performance Management Chart. All of this provides you with an invaluable way to visualize your training load and plan the perfect peak for your next event. Every athlete wants to be as prepared as possible for their next event in order to set a new personal best, get on the podium—or win! By recording your workouts and using TrainingPeaks metrics to plan your training and track your progress over time, you will be headed down the path to optimal performance.